Another variation on the traditional piccalilli. The only constant with piccalilli is the turmeric which imparts the distinctive yellow colour. Wash and wipe the tomatoes, cut into quarters. Break the cauliflower into sprigs. Wash and drain well. Peel the shallots and leave whole. Peel, cut and dice the cucumbers. Top and tail the French beans and cut into 1″ (2.5 cm) lengths. Put all the mixed vegetables into a bowl in alternate layers, with a generous sprinkling of salt and leave overnight. Mix the sugar, curry powder, turmeric, mustard and cornflour into a smooth paste with some of the cold vinegar. Heat the remainder of the vinegar in a large pan and pour onto the mixed curry powder etc. Return to the pan and heat to just below boiling point. Add the drained vegetables and heat without boiling. 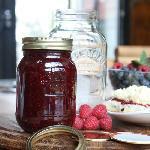 Turn into clean, hot, sterilised jars and cover. Label with contents and date when fully cooled. I’m glad to hear that you like the site. We do aim to please! There should be even more recipes on soon and I’m sure John’s articles on Month to Month Vegetable Growing will be of interest to your husband. How can this piccalilli recipe ever thicken? Don’t you need to boil with flour to get a smooth creamy thick sauce? I shall, however, try it. I’ll let you know! 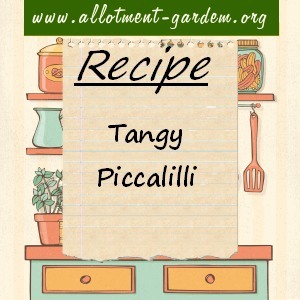 Brilliant recipe – I added Courgettes as well and called it Garden variety! How long does home made picallili keep unopened please? Theoretically years! If you’ve used cauliflower it will lose it’s crispness though. It’s best to eat it within 1 year in my opinion. Just made large batch of piccalilli and stored them for a day but still seem a bit watery, is thre anythin I can do at this late stage. Tip it back out of the jars into a pan, bring back to the boil and allow to simmer off some excess fluid. If it takes too long, add some more cornflour mixed with a little water. 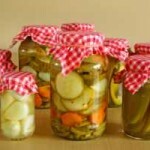 Don’t forget to thoroughly wash and re-sterilise your jars if you do this. Can anyone tell me how to store picalilli as I have been told 2 ways, one is in sunlight and to occasionally shake/turn jars, I assume to thicken sauce, second one is to store in a cool dark place, first time I have made this so any help greatly appreciated. I made some piccalilli but it seems to have gone very thick in the jar – nice and crunchy but very thick how can I make it a bit more runny. My husband and I have recently come to the top of our council’s waiting list for an allotment! This site is such a wonderful resource! The wealth of info and advice is very much appreciated and we can’t wait to get started! I’m going to start making chutneys and pickles … and am a total piccalilli fiend, so thank you for this!!! Hi Great to discover this site. My raised beds are going to be installed today in my back garden, I cant wait, will be back looking for hints cos Ill probably kill more than I grow. Just opened a jar of Picallili I made a batch for the first time in January, it’s just gorgeous, glad it went right cos I hadnt tried it before, cant wait to get growing. I love baking and gardening and we have our own hens so great supply of eggs! HI, JUST WONDERED WHAT I COULD USE INSTEAD OF TOMATOES AS I CAN’T GET MY HANDS ON ANY GREEN ONES.